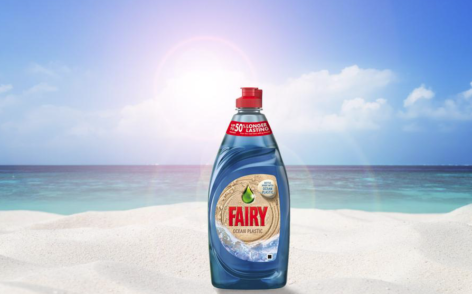 At the 4th “Our Ocean” conference in October 2017 in Malta, the Procter & Gamble Company announced the launch of the first-ever Fairy “Ocean Plastic bottle”. This new dish soap dispenser is entirely made out of post-consumer recycled (PCR) plastic and ocean plastic, collected from the ocean and beaches around the world. The packaging was created in partnership with recycling expert TerraCycle, in order to raise awareness about the plight of our ocean, hurt by human activity through pollution, and about the importance of recycling. Did you know that the oceans cover 71% of our planet and that nearly half of the world’s population depends directly on the sea for their livelihood? As the world’s No. 1 dishwashing liquid, P&G takes its role very seriously. Thus, the launch, planned in the UK in 2018, will include 320,000 bottles, the largest production run of recyclable dish soap bottles in the world made of plastic from the ocean. This initiative, answering the increasing consumers need for sense and environmentally responsible behavior can be a key differentiation and preference lever for the brand. ‽ What about you, how could you bring a new sense to the act of consumption while reinforcing your brand attractiveness ?